Ottoman archaeology has progressed significantly in the last ten years from a study of the "Dark Ages" to a multi-faceted investigation into the history and societies of the longest-lived Muslim empire of the Early Modern era. What have been missing from the scholarship of the period, however, are the nuts and bolts of Ottoman ceramics from a regional perspective: technical studies that identify and define assemblages and produce typologies and chronologies of specific wares that go beyond the site-specific studies dominant in current scholarship. This monograph addresses this gap in the literature by pulling together technical studies on pottery from the eastern frontiers of the Ottoman Empire: Cyprus, Israel, the Palestinian territories, and Jordan. The geographical focus of the book recognizes the cultural, historical, and economic interconnections that made this region a distinctive orbit in the Ottoman sphere and that represent both the commonalities and diversities among the provinces that constituted the "Middle East" of the Ottoman world. 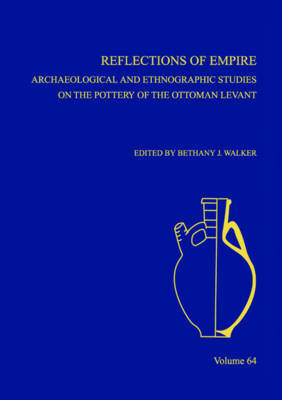 The monograph presents previously unpublished Ottoman pottery from largely archaeological (and specifically stratified) contexts and assesses their potential for understanding the larger cultural history of the Ottoman's eastern frontier. The individual authors are leading ceramics specialists in the region and have each worked on multiple projects in different countries. Rather than merely a collection of individual studies, the monograph is comparative and synthesizes our current knowledge of Ottoman ceramics in a way that is useful technically to field archaeologists and on a theoretical level to scholars of Ottoman social history. Bethany Walker is a professor in the history department at Missouri State University. Walker's areas of expertise include world history, Middle Eastern history, Middle Eastern archaeology, and women in Islam. She is interested particularly in Islamic archaeology in Jordan, Egypt, and Yemen; history of medieval Islam; and Mamluk Jordan, among other things.